We’ve added to our product line again. We are now offering another alternative of supporting your breadboard needs. Using similar construction as our Conventional Non-Vibration Isolation Table stands but now with (4) Air cylinder assemblies to provide the stable surface needed for those critical experiments and measurements. Utilizes the same type of air springs found in our independent leg systems. There are a variety of approaches to vibration isolators for optical tables. All of these come down to having to isolate in the horizontal direction and vertical direction. Piston isolators have the limitation that the isolation is only in the piston direction, normally the vertical axis. As a result, an additional method is required to provide horizontal isolation. In gimbal piston isolators, the horizontal damping element is normally a thin wall rubber membrane isolator. Vere isolators use a rolling lobe method of isolation. This uses a thin membrane in the horizontal axis and the same thin membrane forms the vertical axis as well. This is a time proven method used for all types of vibration isolation. Vere systems use minimal damping because damping is accomplished by conducting energy from the table to the floor to stop movement. Unfortunately, it also transmits energy from the floor to the table which decreases the performance of the isolation. The real performance measure of an isolator is the resonant frequency. Most vibrations of concern are from 10 - 150 Hz with the greatest energy being around 30 & 60 Hz due to electric motor vibrations. As long as an isolator has a resonant frequency below 2 - 3 Hz, you will have acceptable isolation. Beyond that, air isolation is just the resonant frequency of the isolator combined with the weight of the table. As long as the movable elements in the legs are very thin so friction is reduced, and there are elements in the horizontal and vertical axis, there is nothing that can be done to increase performance further. Physics of an air spring and mass defines the best performance. 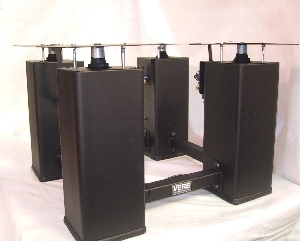 VERE is now offering our High Repeatablity series of Vibration Isolation Table Stands. Built similar to the picture on the right, we will add the Isolation Canisters, Control Valves, Air regulator and hardware necessary. All you need to have is a minimum of 100 psi from a Clean, Dry, Constant Air source. Call for Specifications and more information.